The Family Educational Rights and Privacy Act of 1974, as amended (otherwise known as FERPA), sets forth requirements regarding the privacy of student records. FERPA governs release of records maintained by an educational institution and access to those records. This page explains the rights of students with respect to their educational records, and outlines the University's procedures to comply with the FERPA. Copies of the Act and any University policies related to the Act are available online through the University Registrar’s website at; http://registrar.osu.edu/policies/privacy_release_student_records.pdf and from Buckeye Link (formerly the Buckeye Link) or College Offices. Questions concerning FERPA should be referred to the University Registrar, your college/extended campus office, or the office that maintains the student record in question. Release of Student Record Information is generally not done by The Ohio State University without the expressed, written consent of the student. There are some exceptions regarding Directory Information, emergency situation, subpoenas (lawfully issued), parent requests of a dependent student and an educational “need to know” (to appropriate faculty or staff of Ohio State). The Ohio State University has designated the following information about students as public (directory) information, which may be released without the student’s consent: name, permanent address (does not include home/local, physical, or dorm address), official university email address, home telephone (does not include dorm or cell phone), program of study (including college of enrollment, major, and campus), enrollment status (e.g., full-time, part-time, withdrawn), dates of attendance, names of honors awarded (e.g., Latin honors, dean’s list, scholarships-with the amount excluded), previous educational agencies or institutions attended, participation in officially recognized activities and sports, and weight and height of members of intercollegiate athletic teams. Due to the University Registrar's contract with the National Student Clearinghouse, verification of enrollment and degree completion must be requested and verified through the National Student Clearinghouse. Students have the right to withhold the release of Directory Information, visible on “Find People”. 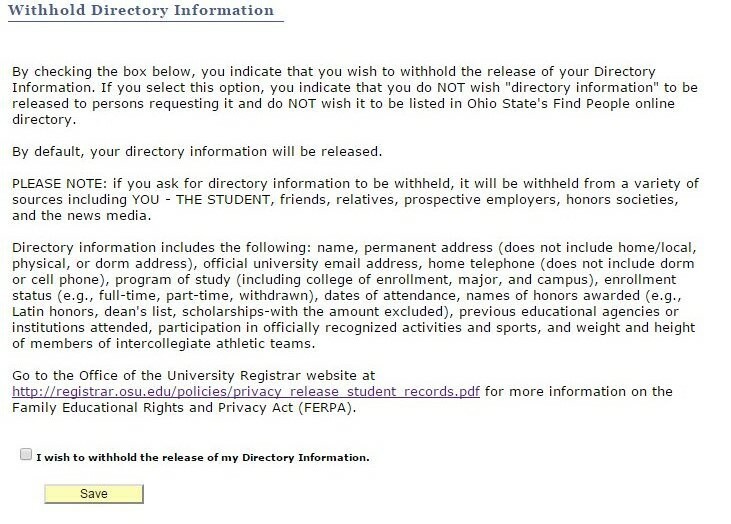 To do so, a student must designate “I wish to withhold the release of my Directory Information” in his or her Buckeye Link. It should be noted that if a student asks for Directory Information to be withheld, it will be withheld from a variety of sources, including: the student, friends, relatives, prospective employers, honor societies, and the news media. Each student is advised to carefully consider the consequences of a decision to withhold Directory Information. Information regarding e-mail address, previous dates of attendance, degrees and awards received (to include honors, majors, minors and specializations), previous educational agencies or institutions attended is always considered releasable. For more details please review our Privacy and Release of Student Education Records. The Release of Information Authorization forms are available at the Buckeye Link, 1st Floor Student Academic Services Building, 281 W. Lane Avenue, Columbus, Ohio 43210. The right to review records is effective once a student is enrolled. They have the right to review their educational records, except for those excluded by law, such as: Records kept by a campus health professional, parent financial records and confidential letters of reference. Educational records are not maintained at The Ohio State University in any one central office, but are kept in the respective colleges and schools, the Graduate School, graduate departments, extended campus offices, the Office of the University Registrar, the Office of Student Financial Aid, the Office of Admissions, Office of Student Affairs, etc. For a complete list of offices which maintain education records, please contact your college/extended campus office or the Office of the University Registrar. Questions regarding the review of individual student records should be directed to the specific location and custodian of the records for that unit. If a student encounters any difficulty in reviewing the appropriate educational record, the questions should be referred to the University Registrar’s office or to the Student Advocacy Center. A student may challenge the content or the right to review a student record by notifying the University Registrar in writing. The University Registrar will promptly review any such allegations.